When I heard that one of my favorite musical artists was going to be performing at a nearby club I almost screamed. I absolutely love her music, style, and most of all her beautiful locks. 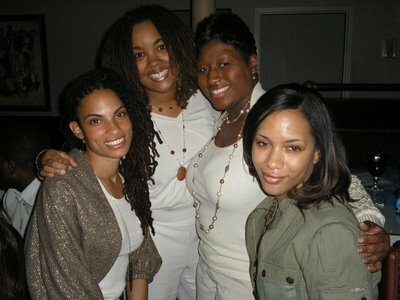 Check us out with Goapele...we look like we could be part of her band...lol. I saw Goapele in concert a couple months ago at the Cleveland House of Blues. Her voice is phenomenal! Your photo looks so adorable. I'm jealous. great picture. both you you are rockin your locks. She is awesome I absolutely adore here dang this is so cool! Nice photo. When are you and Ms V. going to come to Texas? We all need to get together. We really do need to plan a trip out there. I'll talk to her about it. I'm going to NYC next weekend and I'm going to try to have as much fun as you all had!